A few weeks ago I promised more kale and I’m here to deliver! We’ve been on a major kale kick lately and this has been the perfect summer side salad. This summer I’ve teamed up with Bertolli® Olive Oil to remix two classic summer recipes. I spun the Bertolli® Olive Oil bottle to see what classic summer recipes I got to recreate with my own spin and landed on a kale salad and some chicken veggie kebabs. I’m so excited to share these recipes with you! So yes, that’s right, this post has TWO recipes! 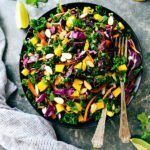 We will start with this kale salad and then right after the recipe for the salad are some pictures and then another recipe for some amazing orange ginger marinated kebabs. 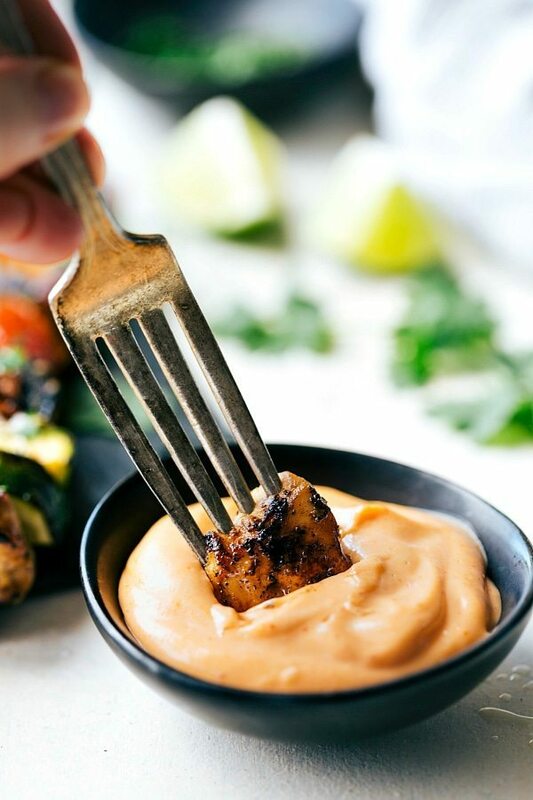 Those kebabs also happen to have an easy 4-ingredient creamy Sriracha dipping sauce that you do not want to miss! And finally, there is also a video tutorial for the chicken kebabs right above the recipe. Whew. Lots of good stuff going on here today! 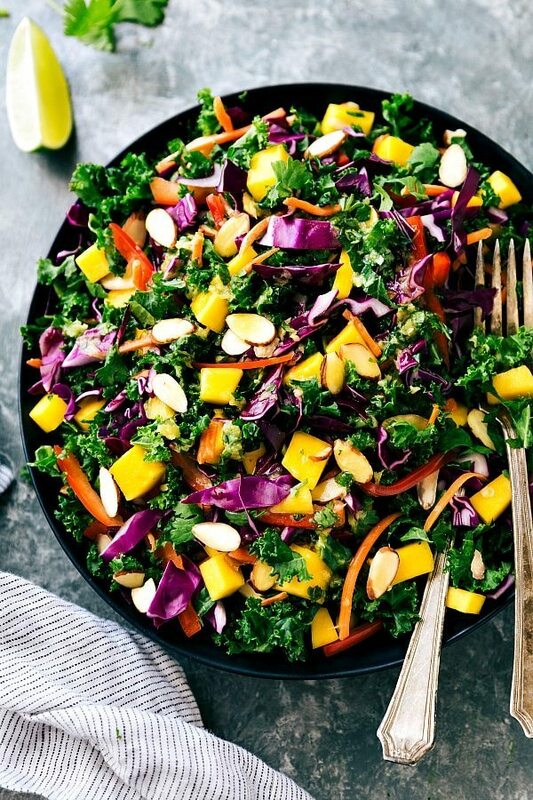 This kale salad is a remix on a summer classic by adding a bit of an Asian flair to the ingredients and particularly to the dressing. 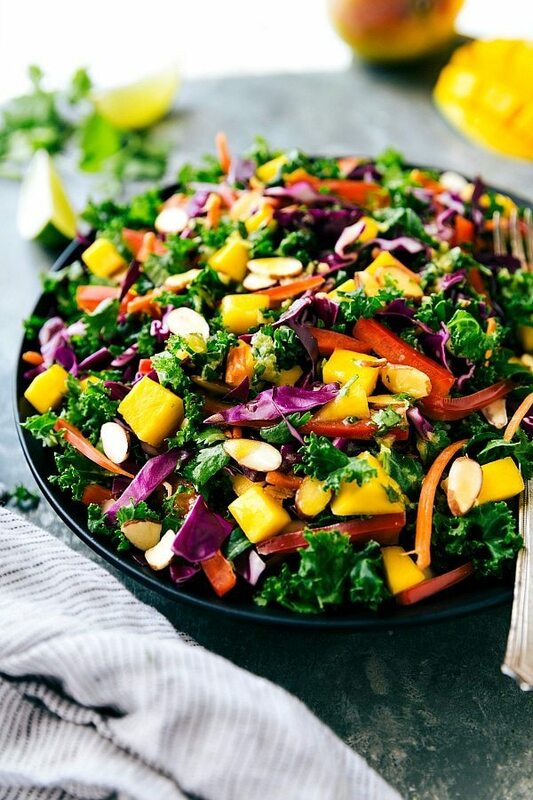 The orange ginger dressing is truly the star of this kale salad! This salad is insanely quick to make and one of the best parts about it is that it can all be prepped ahead of time. Because you are able to make these two recipes in advance, you will have amazing dishes to serve to company without being stuck behind the scenes cooking. This is a big deal for me when entertaining through the summer months! I want to be with friends and family, not stuck in the kitchen finishing meal preparations. All of the salad ingredients, with the exception of the almonds, can be tossed together well in advance. The dressing can also be made in advance and is even better when it’s made earlier. When the dressing is prepped earlier this allows the flavors to truly meld and intensify. With everything made in advance you can easily toss the salad with the dressing, add the almonds, and serve a delicious crowd-pleasing salad. First prep the kale: remove the coarse stems and discard. Take the kale leaves and finely ribbon the kale to have very thin and small pieces of kale. Massage and rub the kale with your hands for at least 2-3 minutes or until tender and a deeper green color. Rinse again and dry thoroughly. Wet kale will keep the dressing from adhering well. 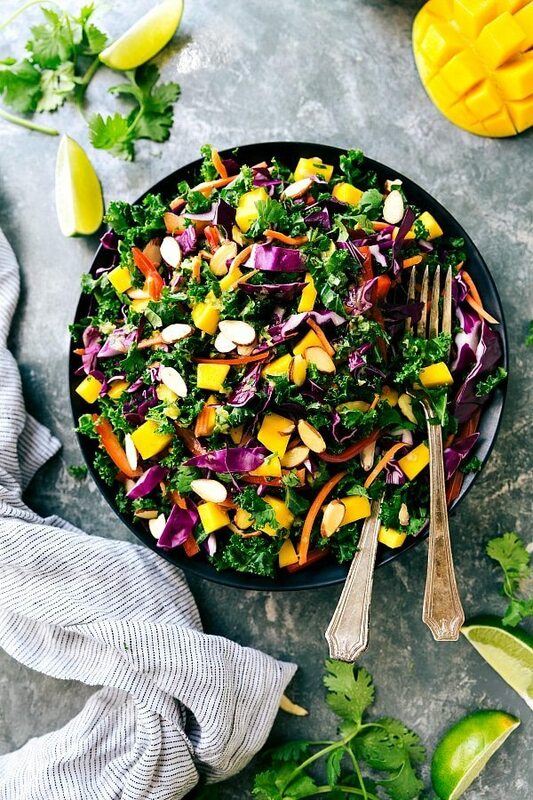 In a large bowl toss together the prepared kale, shredded cabbage, shredded carrots, mango, red bell pepper, almonds (add later if you aren't serving immediately), and cilantro. For the dressing, whisk together all of the ingredients until combined. Season with salt and pepper to taste. Pour dressing over prepared salad, toss well, and enjoy immediately. Here we are for RECIPE #2. There are quite a few ingredients that overlap from the salad to these kebabs which is one of the reasons they pair so well together. That, and they taste fantastic together as well! 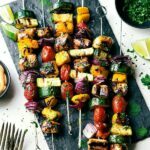 These kebabs are a remix on traditional summer kebabs because of their unique marinade and also because we add some fresh mango. Not too many kebab recipes have fresh mango on them, but I’ll tell you that once you grill mango, you’ll never want to go back. Grilling mango greatly enhances the natural sweet taste and adds a fun flavor to the chicken and other vegetables. Both use orange juice/orange juice concentrate (I bought 1 container of concentrate and used it for the kale salad and then used the juice for this chicken marinade), both have ginger, both have mango, both have cilantro, and finally they both use varieties of Bertolli® Olive Oil! It has been so fun to work with Bertolli Olive Oil® to remix classic summer recipes for this post and to learn more about the different kinds of olive oils in the process. The marinade uses Bertolli® 100% Pure Olive Oil which is a refined olive oil and better suited for high heat cooking because it has a higher smoke point than Extra Virgin Olive Oil. 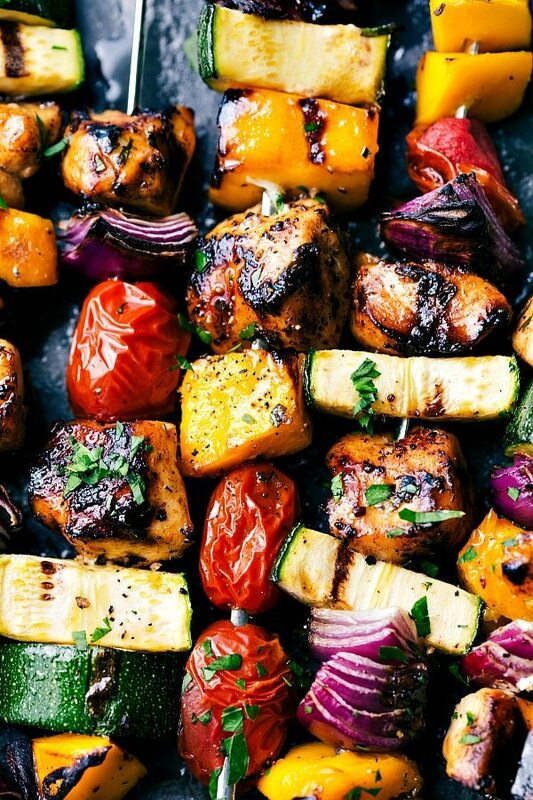 This is why it’s perfect for these grilled kebabs. It’s a popular myth that you can’t cook with olive oil because it will burn but it’s really a matter of using the right type of olive oil. Bertolli’s® 100% Pure Olive Oil is great to cook with regardless of the temperatures. Bertolli’s® brand expression is “Made Better With Bertolli®” and you will find that Bertolli’s® 100% Pure Olive Oil’s milder flavor makes it more versatile AND the higher smoke point will allow you to use if for high heat cooking such as grilling. 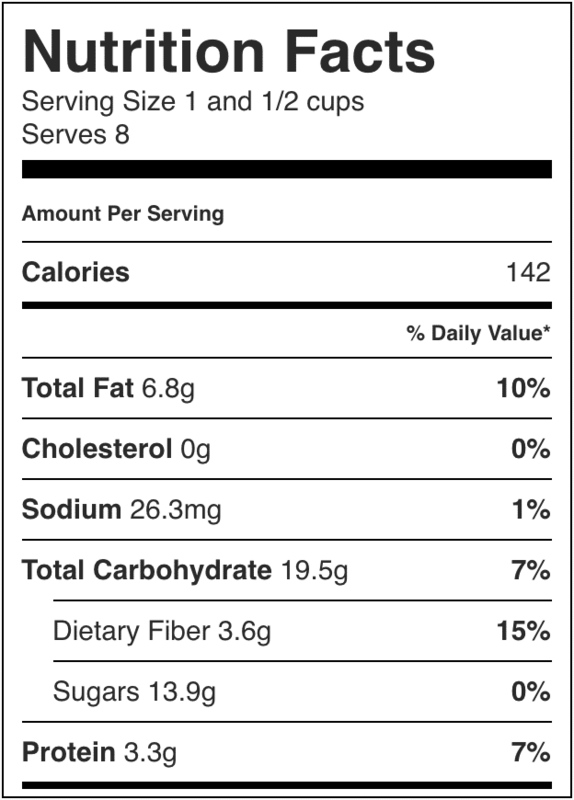 The salad uses Bertolli® Extra Virgin Olive Oil which is cold pressed, and therefore retains the most flavor. You can use EVOO when you can really want to appreciate the rich flavor that it adds to your food such as in a salad dressing. So just like the salad, these kebabs are prepped in advance. In fact, the more advance (6-8 hours) the better! Some tips to prep these in advance: the chicken needs to marinate for a while, so that should already be prepped ahead of time. You can also have all the veggies ready to go — wash and dry them ahead of time. 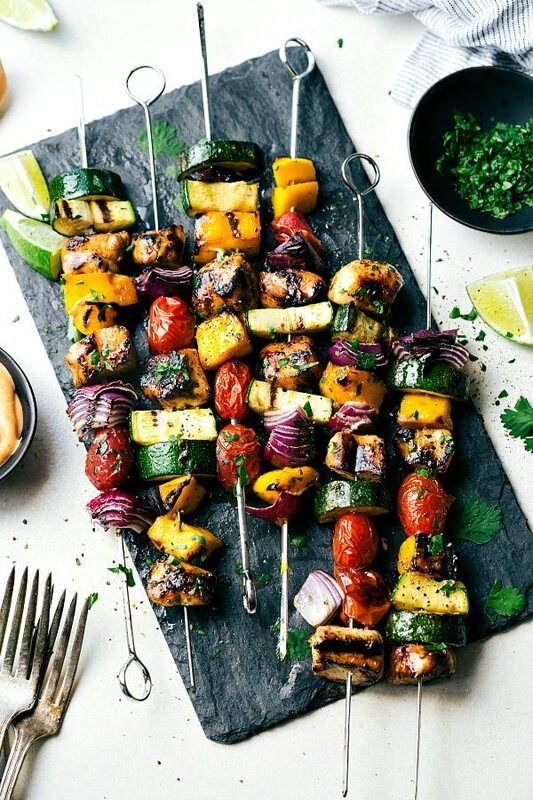 Then you can chop/dice the vegetables and either put them on a skewer so they are ready to be grilled OR store them in tupperware in the fridge. By having the chicken and veggies prepped ahead of time, that only leaves the grilling which is super low maintenance. Whisk together all of the marinade ingredients in a medium-sized bowl. Remove about 1/3 cup (put in an airtight container in the fridge for later) and pour the rest into a large sealable bag. Cut the chicken into bite-sized pieces and put in the marinade. Place in the fridge for at least 3 hours making sure to flip the bag halfway through the time it is in the fridge. I recommend marinating for 6-8 hours. Once the chicken has been marinated, place the chicken pieces on a skewer with your choice of prepared fruits/veggies. Lightly oil the grill grate by generously dipping a paper towel in olive oil and using tongs to rub it on the grill grates. Then place the skewers on the grill. Cook for 10-12 minutes turning as needed (depending on the size of your pieces) or until chicken juices run clear. 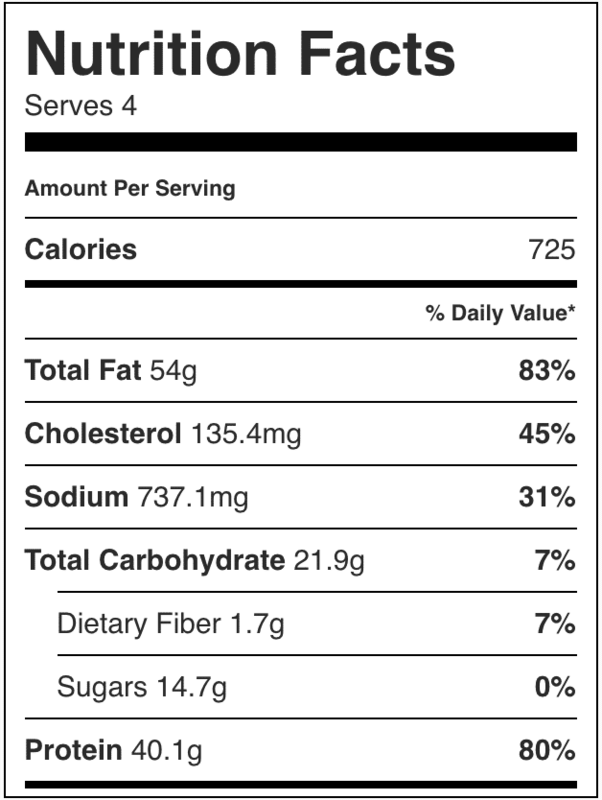 As you turn the kabob sticks, make sure to brush the chicken with the reserved 1/3 cup marinade frequently. Serve with the sriracha dipping sauce and additional chopped cilantro if desired. *I use this recipe to make homemade mayo for the sauce: http://www.epicurious.com/recipes/food/views/homemade-mayonnaise-241868. I used Bertolli® Extra Virgin Olive Oil in place of the Canola Oil.